I stumbled upon this image on the web, and I thought it was very thought-provoking. 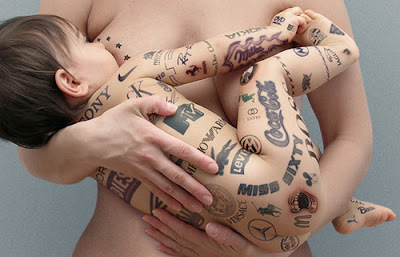 It amazes me how young children begin to recognize labels and logos (called “environmental print” by educators) and use them to make choices. What would our lives be like without such brand knowledge? That is quite a striking image. It is amazing how much of it can be eliminated if you cut out t.v. (we are a television free household). That being said, now that my child is almost five, he is encountering branding through friends and noticing it on billboards, etc. I can only shield him for so long. SCARY!